Mike over at Vox Political also put up a piece today about the suspensions of Wallasey constituency Labour party by the Labour Party’s general secretary, Ian McNicol. Apparently, there had been complaints about bullying and intimidation, though the real reason may have been that the party had voted to deselect Angela Eagle, and was planning another meeting at which the deselection would be approved. It was also planning to pass other decisions, which would be sent to the national party. Mike wonders whether it Mr McNicol has bothered to investigate the complaint, or whether it is a case, where the authorities have used unsupported excuse of there having been a complaint to stop an event they didn’t like. In Mike’s case, this was where the local council would ban any event they didn’t want using that excuse. The accuracy of the complaint was never investigated, so there was never any proof. He also makes the point that it does not seem that Mr McNicol issued the party with a written warning before he suspended it, as he is required to do under Chapter 6 of the party’s rule book. If there is no proof that there was bullying and intimidation in the party, and if no written warning was issued, then Mr McNicol is liable to be investigated and suspended for his infraction of the rules. This seems to show just how desperate the parliamentary Labour party is to cull Corbyn supporters from the membership, and the complete contempt the Blairites have for the grassroots. They’ve already suspended Brighton, the biggest constituency Labour party. There were allegations of intimidation of anti-Corbynistas in the local Labour party for Bristol East, though Mike has reported that despite the local Labour MP Thangam Debonnaire giving her support to the supposed victims, other people at the meeting claimed it was no rowdier or threatening than usual. Of course, Blair had similar intolerant attitudes to possible sources of dissent in the Labour party. He had the public schoolboy’s hatred of the trade unions, and one of the first things he did when he took over the Labour party was threaten to cut the party’s ties with them. As the Labour party was partly founded by the unions to represent working people in parliament, this was an attack on a core, founding element of the party. This also reminds me very strongly of the actions of the Parliamentarians during the Civil War. This was ‘Pride’s Purge’, when Colonel Pride entered parliament on 6th December 1648 to arrest 45 MPs and prevent 78 more from taking their seats. Twenty more MPs refused to take their seats. As a result, the ‘Rump’ parliament was the acquiescent tool of the army. It’s presumably this piece of history which has inspired the name of Tom Pride’s blog, ‘Pride’s Purge’. The rump parliament differs from the current Labour administration in that it was actually very radical. It abolished the House of Lords, the monarchy and declared Britain a commonwealth. Blair reformed, but did not abolish the House of Lords, packing it with more of his supporters. And economically, his followers were very determined to maintain and expand the status quo in the form of capitalism and the power of private industry. There is one other similarity between the Cromwellian interregnum and Tony Blair, however. Both began terrible invasions of other countries, which has resulted in massive bloodshed and a legacy of terrible national and social division. Cromwell invaded Ireland, an event which is notorious in Irish and British history for the terrible atrocities inflicted on the Roman Catholic population. And Blair joined Bush in the illegal invasion of Iraq, which has also destroyed the country and resulted in massive bloodshed and atrocities. 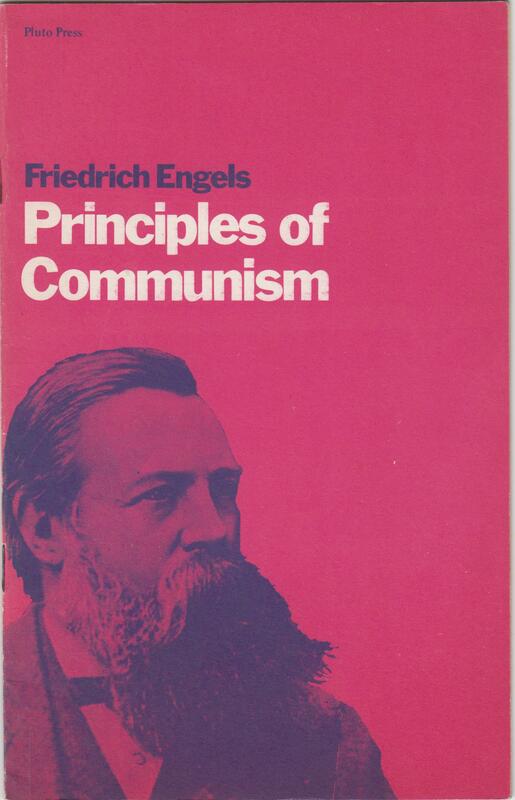 This morning I posted up a few extracts from Friedrich Engels’ Principles of Communism, published by Pluto Press. The Principles of Communism was the first draft of the Communist Manifesto. Unlike the Manifesto, it’s short – only about 20 pages or so, laying out the essence of Communism in the form of a catechism – short answers to particular questions. Not having a copy of the Engels text to hand, I think many would be interested in his thoughts on how socialism and communism differ. It is at the heart of many misunderstandings at the moment! 24 How do Communists differ from Socialists? (II) It seeks to establish the rule of the aristocracy, the guildmasters, the small producers, and their retinue of absolute or feudal monarchs, officials, soldiers and priests – a society which was, to be sure, free of the evils of present day society but which brought with it at least as many evils without even offering to the oppressed workers the prospect of liberation through a Communist revolution. (III) As soon as the proletariat becomes revolutionary and Communist, these reactionary Socialists show their true colours by immediately making common cause with the bourgeoisie against the proletarians. The second category consists of adherents of present-day society who have been frightened for its future by the evils to which it necessarily gives rise. What they want, therefore, is to maintain this society while getting rid of the evils which are an inherent part of it. To this end, some propose mere welfare measures while others come forward with grandiose systems of reform which under the pretence of reorganising society are in fact intended to preserve the foundations, and hence the life, of existing society. Communists must unremittingly struggle against these bourgeois socialists, because they work for the enemies of Communists and protect the society which Communists aim to overthrow. Finally, the third category consists of democratic socialists who favour some of the same measures the Communists advocate, as described in question 18, not as part of the transition to Communism, however, but rather as measures which they believe will be sufficient to abolish the misery and the evils of present-day society. These democratic socialists are either proletarians who are not yet sufficiently clear about the conditions of the liberation of their class, or they are representatives of the petty bourgeoisie, a class which, prior to the achievement of democracy and the socialist measures to which it gives rise, has many interests in common with the proletariat. It follows that in moments of action the Communists will have to come to an understanding with these democratic Socialists, and in general to follow as far as possible a common policy with them, provided that these Socialists do not enter into the service of the ruling bourgeoisie and attack the Communists. It is clear that this form of co-operation in action does not exclude the discussion of differences. From what I learned at College, there are a number of differences between Communism and Socialism, and there are a number of different forms of Socialism. The main difference, which split the Socialist parties off from the Communists at the end of the 19th century, was over the question of whether a revolution was needed to bring about the power of the workers. Marx and Engels were part of the European revolutionary tradition, though they did not oppose fighting elections and in part of their writings looked forward to a peaceful transition to Socialism. Reformist Socialists, such as Eduard Bernstein in the German Social Democrats, pointed out that instead of getting poorer as Marx and Engels had predicted, the European working class seemed to be becoming better off. He therefore recommended that the SPD should concentrate on fighting elections and promoting the interests of the workers that way, rather than on trying to bring down the system through revolution. Communism also differs from Socialism generally in that it sees the essence of history as the struggle between succeeding classes. It sees the motor of history as being economic relationships, in which each classes creates in turn the class that eventually is destined to overthrow it. Thus feudalism and the rule of the aristocracy gave rise to bourgeois capitalism. This cleared away aristocratic rule and set about instituting democracy instead. The bourgeoisie in their turn created, through mechanisation and big business, the working class, who do not own the means of production, but merely work at the big machines owned by the factory masters. The working class are therefore the last class to be created by the process of Dialectal Materialism, and will overthrow the bourgeoisie and private property. There’s also an exclusive emphasis on the role of the working class in the struggle to create a Socialist system. The working class are seen as the only genuinely progressive or revolutionary class, as opposed to the lower middle class or the peasants. This has been modified. For example, Mao based his revolution on the Chinese peasantry, and so significantly modified Marxism in this respect. As did the Russian revolutionaries, who brought about a Communist state in the Soviet Union, when most of the population were still peasants and the working class only constituted a small minority. Marx and Engels expected the first Socialist states to be in the industrialised nations of Western Europe, and were very doubtful about a Socialist revolution succeeding in the Russian Empire. Marxists also believe in the transvaluation of values. That is, there is no objective, eternal set of moral values. Each society develops a system of morality appropriate for its time, based on the economic foundations of that society. Thus, while Marx is scathing about the exploitation of the poor, nowhere in his writing is there a moral condemnation of that exploitation. His attitude is in marked contrast to other Socialists, who came to Socialism through religion and ethical considerations, such as some of the Fabians. Lenin and the Russian Communists were extremely sniffy about them, as Marxism considers that it gives an objective account of the origins of society and social change, in contrast to the subjective analysis based on morality of other forms of Socialism. Communism also differs from other forms of Socialism in that it regards Socialism as merely a transitory period during which people will get so used to sharing, that eventually the state will wither away and something like anarchism will emerge instead. Finally, Communism in practice has largely consisted in nearly total nationalisation and a one-party state, although China is now one of the major capitalist nations, and reforming, dissident Communists like Imre Nagy in Hungary and Anton Dubcek in Czechoslovakia, and also Mikhail Gorbachev, wished to replace the coercive Communist system of Stalinism with ‘Communism with a human face’, in which other parties would be permitted and the Communist party would have to fight elections like everyone else. Earlier today Mike put up a piece reporting that the government had won its battle to keep details of discussions between Prince Charles and government ministers out of the press, despite the fact that the Information Commissioner has stated that it is in the public interest for it to be released. Mike’s correct, of course, but this is the way government works in Britain. It has a profound fear and suspicion of the people it governs, and is perpetually concerned to protect its secrets while trying to garner as much information as possible on the rest of us. Under Thatcher this mania for secrecy became so extreme, that the various cabinet ministers, who were members of different cabinet groups, could not tell their cabinet colleagues what was being discussed in these different committees, despite the glaringly obvious fact that as cabinet ministers, they should all automatically have been expected to have had the clearance to share the information with their colleagues, who were at the same level of trust. Bliar’s introduction of the Freedom of Information Act was a step in the right direction, but it was weak even when it was introduced. And since then, the Tories and New Labour apparatchiks like Jack Straw have been determined to make it even weaker. It’s not hard to see why both political groups distrust the Act. It makes government difficult, because it opens it up to public scrutiny. It’s so much easier to ride roughshod over people by not letting them know about important government decisions, and taking the attitude that, as members of the public, they cannot possibly know what is really in the public interest. Or in the case of Thatcherites everywhere, the private good of big business. And they definitely, really don’t want information about Prince Charles’ dealings with the government getting out at all. The monarchy and royal family is supposed to be above politics, and they are not supposed to influence government policy. It’s probably because they are supposed to be apolitical, that the monarchy has survived in this country, while other nations have become republics. Political interference from an unelected source is always resented. And so the concern to keep the monarchy out of politics. Hence the monarchy’s ire when Gove or whoever it was in the ‘Brexit’ campaign claim that the Queen also wanted us to leave the EU. Charles’ negotiations are sensitive, because he’s violated that cardinal rule. The Independent, some of whose columnists had a strongly republican bias, covered several stories in which Charles’ correspondence with various governments over the years was a source of embarrassment, and which they were desperate to stop being released to the public. Among his pet subjects were the closure of the grammar schools. Lugs was thoroughly against this, and wrote numerous letters to the government to try to get them to change this policy and reopen them. The ministers at the receiving end of his correspondence were forced to reply that this was no longer an option. This is why the government really doesn’t want to release the details of Prince Charles’ discussions with ministers about the environment to the Mail on Sunday: it compromises the position of the monarchy. Not that the Daily Heil is necessarily worried about this in the specific case of Prince Charles. From what I can remember, it has had a profound dislike of the heir to the throne, and has run no end of stories about how he is an embarrassment to the Crown. At one point it ran a story that ‘ministers’ were considering amending the rules of succession, so that it could skip a generation and go either to his sons, or it would pass to the eldest child. In which case, Princess Anne would succeed her mother. There was a rival of these stories of constitutional tinkering in Private Eye last week in connection to the Commonwealth. The Eye claimed that many Commonwealth countries aren’t impressed with him either, and would also like to change the constitution of the Commonwealth, so that its head was elected. I can see how the various independent countries across the globe would prefer this system, rather than be ruled by the hereditary monarch of the country that invaded and colonised them, as a general principle. But the Eye didn’t mention any of that. Instead, it was just about stopping Charles becoming head of the Commonwealth. And so the government remains desperate to keep a lid on whatever it is that Prince Charles has said to ministers, while even more enthusiastically snooping on everyone else. And I’m sick of it. I’d far rather we had a government like that of Kurt Eisner, the German Socialist head of Bavaria during the ‘Council Revolution’ of 1919. Eisner was a Jewish theatre critic, who saw Russian-style workers’ soviets not as a replacement for democracy, but as extension. And he had no time for government secrecy. His office was open to everyone, and he quite happily showed members of the public papers marked ‘government secrets’. Unfortunately, he was beaten to death by the Freikorps when they stormed Munich to put the Revolution down. Eisner and his regime may well have been too extreme, but we desperately need some of his faith in genuinely popular and open government here across the North Sea in the 21st century.